Two schools who are not even in the same neighbourhood because of the distance apart but very close in brotherhood will once again take to the rugby field on Saturday 30 July 2016 to continue a rivalry that started in 1929. Grey High School from Port Elizabeth first took the initiative with an inland tour in 1929 that started off with them playing St Andrews in Grahamstown and working their way up north to Bloemfontein. There they played their brother school for the first time and lost 0 -16. They invited Grey College to come down to PE the following year and the Bloemfontein Boys dually accepted and in 1930 they undertook their first tour to Port Elizabeth. In a closely fought match the boys from Bloem again triumphed with a 9-7 win. For some unknown reason lost in the midst of time, the two schools took another 23 years before they played each other again. Grey PE toured to Bloemfontein again and lost 13-3 in 1953. It took another 10 years for the two Greys to square up again and the 1963 game was a drawn match of eight all while the 1968 game was also a draw. The 1972 match introduced the first unbroken sequence of matches that continues until this day. In all that time there was only another two draws in 1973 and 1990. Grey PE won their first match against their Bloemfontein Brothers in 1976 at the anniversary of the tenth meeting between the two teams. On a day of high drama on the Philip Field at Grey PE, Robbie Logan slotted a last minute penalty for Grey High to emerge as 13-12 winners. Since then, Grey High has only been on the winning side a further seven times with their last win coming in 2014, just showing the dominance that their counterparts from Bloemfontein have in the Derbies. Both teams are having a very good season in 2016 with the Bloem boys only losing one game against the number one ranked school Paarl Boys. Grey High have only lost three games so far against Daniel Pienaar, Paul Roos and Dale College. 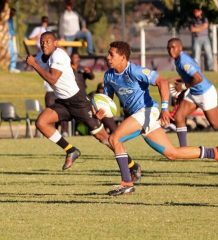 They were both well represented at the national youth weeks at Kearsney with Grey College having 23 representatives in the Free State Craven Week (13) and Academy teams (10) and Grey High had nine players all in the EP Craven Week team. They also managed to produce two SA Schools players each in Khwezi Mafu (no 8) and Sihle Njezula (Utility Back) for Grey High and Rewan Kruger (scrumhalf) and Rikus Pretorius (centre) for Grey College. A Further three players from Grey College received SA A colours (Jaco van Tonder, Dian Schoonees and Janco van Heyningen) while two from Grey High were also included in the SA A squad. (Lubabalo Dobela and Ayabonga Oliphant). The game will be broadcast live on SS5 ( channel 205) from 14.55. Grey High has a proud history in South African rugby producing 15 Springboks that represented their country at international level. It is to be noted that two of these players matriculated elsewhere, Ian Kirkpatrick at Kimberley Boys High and current Springbok centre Jan Serfontein, spend his formative years in Grey Primary and Grey High up to Grade 9 before matriculating at Grey College Bloemfontein. Grey has served Bloemfontein, the Free State, South Africa and the world well over the past 150 years. Grey has been able to make adjustments and remain relevant in a changing environment in which it has developed, grown and excelled. The brand is known and revered throughout South Africa and even internationally and the products of the school make a positive difference wherever they are. Parallel medium education, tolerance, respect for others and loyalty to the school are not only traditions, but firm foundations in a global village. Grey is structured on these foundations and it is constantly adapting to new developments. The wave of change washing over our country confirms the value of Grey’s traditions. Grey has produced 44 Springbok rugby players. Since WW II it has produced more Springbok players than any other school in SA. Mutual & Federal Premier Interschools is a series of 12 matches, which feature the highest profile and most traditional interschool rugby rivalries from South Africa’s top rugby schools, which are broadcast live on SuperSport from March to August. Schoolboy rugby has served as one of the cornerstones of domestic rugby dating back more than a century, and true to its slogan “Honouring Heritage. Playing for the Future”, Mutual & Federal Premier Interschools is about history, heritage and tradition. The series, now in its fourth year, is expected to grow even stronger. The Mutual & Federal Premier Interschools stories are further captured in 12 Preview Magazine Shows, which preview all the games and provide historical overviews of these traditional schools and highlight other academic, cultural and sporting achievements.